We all know the ancient Romans were skilled engineers, constructing vast highways to cover the enormous lands they conquered. But did you know they were also fashionable? In the Empire, footwear was used as a status symbol in addition to providing warmth and protection. And with Italy’s reputation for shoes, it should come as no surprise that their Roman ancestors were also good cobblers. 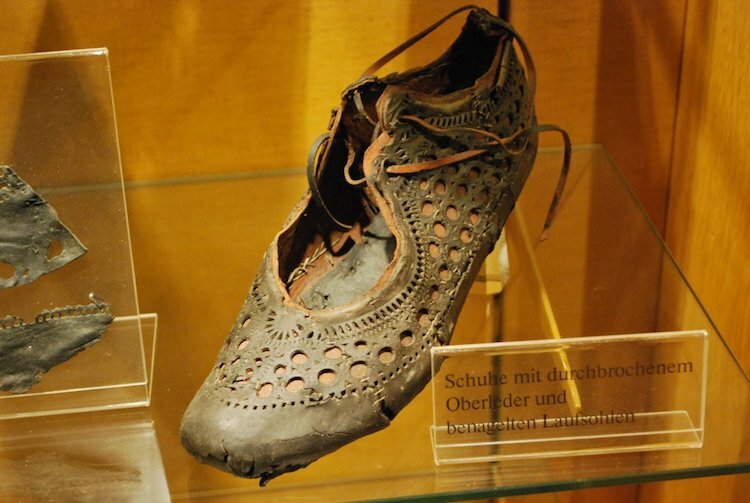 A stylish shoe on display at The Saalburg in Germany shows just how fashionable women in ancient Rome could be. The Saalburg is a Roman fort located on the ridge of the High Tanus mountain and was part of ancient border fortifications in the area. Enormous in scale, the fort and its surrounding village were home to around 2,000 people at its peak. It was constructed in 90 AD and stayed in operation until around 260 AD when a political and economic crisis caused it to go out of use. Since 2005, The Saalburg has been a UNESCO World Heritage Site with a museum that displays items found in the area. This includes a 2,000-year-old shoe discovered in a well before going on exhibit for the world to see. Typical of certain types of ancient Roman footwear, they have a leather upper and a hobnailed sole. Shoes were often modeled after caligae—heavy-soled military boots with lots of open areas. For women, decorative embroidery and patterns were often added to the shoes in addition to laces. Not only demonstrating the craftsmanship of the maker, these shoes helped display the wealth and status of the women wearing them. These thick-soled shoes would have been worn outdoors, with lighter sandals used indoors. Their destiny to be discovered in Germany shows just how much craftsmanship and style traveled within the Ancient Roman Empire. It’s incredible to see that the fashion choices made aren’t far off from the modern shoes we wear ourselves. The post Exquisitely Designed 2,000-Year-Old Roman Shoe Discovered in a Well appeared first on My Modern Met.